In her author’s photos, just as in her prose, the writer Eileen Chang demonstrated an uncanny ability to say exactly what she wanted to say. In the most famous photo—taken in Hong Kong in 1954, and since distributed in every other repackaged collection, new translation, salacious news item, and adoring fan page—a thirty-four-year-old Chang stands on a staircase dressed in a cheongsam-style blouse, posing in such a way that the reflection of the flash off her pearl earrings and the rich embroidery of her blouse gives her face a cinematic glow. Chang’s glamour has been key to her appeal since she first began publishing in middlebrow publications in World War II-era Shanghai. Chang was the descendant of Qing nobility (her great-grandfather, Li Hongzhang, had been instrumental in putting down the Taiping Rebellion), grew up in a series of Shanghai mansions, was educated at a missionary school, and spoke fluent English. Part of the draw of her short stories is that they allow her readers vicarious access to the exotic, sophisticated milieu in which she grew up. Yet at the same time, Chang’s right hand is placed authoritatively on her hip, and her gaze is directed imperiously above the viewer’s eyeline. Chang rules over the worlds she creates like an Old Testament God. Her protagonists are women trapped between the social norms of the old world and the new, who make desperate gambits for just a shred of happiness; they usually lose. In the story “Jasmine Tea,” Biluo is married off and becomes not a “bird in a cage,” but worse, “a bird sewn on a doorscreen . . . as the months and years went by, her feathers became darkened, then mildewed, then moth-eaten. When it was time for her to die, she died on the doorscreen.” She pins characters in with sarcastic barbs and painful silences, and uses omniscient narration to give us a peek at the hopes they will never be able to realize. In her writing, just as in her photos, we access her world, but only on her terms. And Eileen Chang dictated terms to the very end. By the end of her life, she was living in such seclusion in Los Angeles that even the executor of her literary estate had trouble getting in touch. When the Taiwanese paper The China Times gave her a lifetime achievement award, she refused to attend the award ceremony, but sent a photo of herself. In the photo, she looks wryly at the camera, holding an issue of the paper with the headline visible (that day’s news happened to be the death of Kim Il-sung). It looks like a hostage photo, but even though Chang may be posing as a hostage, there’s no mistaking who’s in charge. Until her last days, she remained coolly and magnificently in control. 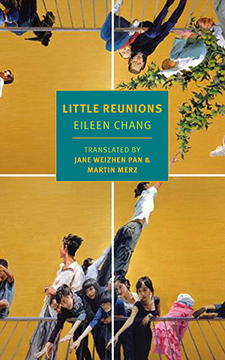 Most of the facts behind Little Reunions (released in January by New York Review Books), a roman à clef of Chang’s early years, have been public record for decades. Chang’s mother was long estranged from her father and eventually divorced him, at a time when divorce was rare and scandalous. She spent much of Chang’s childhood traveling back and forth from Europe, courting a succession of lovers. Her father was an opium addict who, after Chang got into a violent argument with her ex-courtesan stepmother, imprisoned Chang in her own room, where she almost died from dysentery. Desperate to escape Shanghai, she went to study at the University of Hong Kong, on the understanding that if she did well, she then would be funded to study at Oxford. But World War II broke out just before Chang graduated, and she returned to occupied Shanghai without finishing her education. Almost as soon as she did, she began mining her turbulent past for autobiographical essays and fiction. Chang was open about her history, but she described it with a calculating, heartbreakingly jaundiced distance, and there were certain topics she wouldn’t touch. At the age of twenty-three, she began a relationship with the thirty-seven-year-old Hu Lancheng, an impeccable prose stylist himself and a minor official in the collaborationist government of Wang Jingwei. Hu was already married when they met, and almost immediately after he married Chang in a secret ceremony, he openly began an affair with a seventeen-year-old nurse. Hu claimed to Chang that he loved her so much that he had to share his love with other women so as not to overwhelm her (yes, he was that guy). Although their marriage rapidly disintegrated, Chang’s association with Hu made her politically and aesthetically suspect for the rest of her career. It would have been difficult for her to remain in the People’s Republic of China even if she had wanted to; she left in 1952, never to return. The relationship between Chang and Hu has been a topic of fascination, puzzlement, and disgust for Chang’s devoted fans for decades. Chang long demurred to make anything but cryptic comments about the relationship, in part out of an old-fashioned sense of female propriety and in part because it was a lasting source of pain for her. The compilation and publications of Little Reunions, a very thinly fictionalized portrait of the relationship, was consequently a drawn-out affair. She had written about half of the novel by 1975, but had delayed completing it at the advice of her literary executor Stephen Soong, who feared that Hu would respond to its publication by tarring her reputation. She contemplated burning the manuscript, but eventually decided to leave it intact, and it was finally published fourteen years after her death. The unfinished, posthumous novel finally gives us a chance to catch Chang off guard, and it seems to be as close an answer to the mystery of Hu and Chang’s love as we’ll get. But by the end of Little Reunions, the mystery remains. We get a surfeit of information on other important forces that shaped the young woman (“Julie,” Chang’s stand-in in the novel) into a writer. Anyone who reads Little Reunions will understand the origins of the stifling, hypocritical families of her fiction. Julie’s mother is a distant, pathetic stranger who treats her more like a casual acquaintance than a daughter, and her father is perpetually obscured by a haze of opium smoke. She refers to them as Second Aunt and Second Uncle—their place in the baroque family hierarchy­. The endless network of cousins and concubines is less a loving family than a complicated business concern filled with unpaid accounts and threatened lawsuits. Semi-incestuous passions smolder for decades, and other secrets fester and rot. Julie’s brother casually mentions that one of their servants got tired of waiting for his ninety-year-old grandmother to die, and stuffed her in a coffin. Chang understands this world through a cosmopolitan cornucopia of texts. She tells her friend Bebe that she’s found characters resembling her mother in Noël Coward’s play The Vortex, and in Aldous Huxley’s novel Eyeless in Gaza. The film Spartacus shares space with the Chinese opera Celestial Beauty Scattering Flowers; Mildred Pierce with the Song classic of historiography Comprehensive Mirror to Aid in Government. Little Reunions is filled with Julie’s precocious (occasionally pretentious) citations and with distractingly thick descriptions of fashion. Julie wears a “waist-hugging lilac velvet top with no slits, no edging on the high cylindrical stand-up collar, and tight elbow-length sleeves” and a “peacock-blue padded gown of Nanking brocade with bell-shaped sleeves.” Literature is fashion in Little Reunions, but nothing about fashion is trivial for Chang. Chang saw fashion as an index of history as truly lived, as the indispensable means through which we face the world and other people, and literature, for her, functioned much the same way. Learning about Bo Yi and Shu Qi, the legendary eleventh-century-B.C.E. siblings who starved themselves on a mountain out of principle, Julie immediately thinks of herself and her brother and bursts into tears. She was like a tree, inching toward Chih-yung’s window, indistinctly blossoming tiny flowers in the lamplight coming through the window. Yet she was only able to peek at his world through the glass pane. We feel about as distant from their relationship as Julie feels from Chih-yung. There is a problem of opacity at every level of Little Reunions, from character to plot to the text itself. The novel is told in roughly chronological order, but drifts forward and backward in time without warning. This loose structure allows for some thrilling Proustian passageways—the best chapter of Little Reunions jumps from Julie’s honeymoon period with Chih-yung to a graphic depiction of an abortion she had a decade later and then back to her relationship with Chih-yung—but more often suggests that Chang had simply never figured out the best way to arrange her material. Characters appear without warning as if they were old friends, their complex relationships to the people we already know explained once and briefly. This edition provides a character guide at the back of the novel that is much appreciated, and I imagine that anyone who doesn’t know the real story behind the novel will be at pains to put everything together. Mother has already envisaged her own daughter as an impoverished vagabond who one day would somehow find evidence in a scrap of folkloric family legend of infants being switched at birth in order to chase after her maternal uncle’s rapidly dissipating assets. I firmly believe that a sentence like that does not belong in a published English work. I don’t care for the practice of picking one sentence to needle a translation—heck, even Shakespeare had some bad lines—but here it forms part of a pattern. At one point Julie is irritated by Chih-yung for “Pointing at the mulberry to accuse the locust; making oblique accusations like a cursing farmer’s wife.” (指桑罵槐，像鄉下女人的詛咒。) The first part is a literal translation of an idiom that is evocative as is. If you look it up in a dictionary, it is translated as “making oblique accusations.” But “oblique accusations” is an impossibly stiff phrase; “making insinuations” doesn’t exactly mean the same thing, but sounds more like something an English speaker might say. The village woman of the next clause becomes a “farmer’s wife”—which she likely is, but I don’t think that image has any particular traction in English—and cursing confusingly becomes a trait of the woman rather than the action she is performing. The translation is usually readable, occasionally elegant, and to be fair, reflects to an extent the prose of the original, which is breathless and slightly raw. But I worry that the flaws of the translation make a novel that is already uninviting to anyone who doesn’t know the back story even more daunting—a shame because, even given its problems, this novel has many of the cutting moments of insight for which Chang is justly famous. Rachel had trained Julie from a young age not to be the least bit curious about people close to her. Julie always reserved her curiosity for outsiders. The closer a person was to her, the more space Julie reserved for that person. It was like following the principles of Chinese painting—sufficient breathing space is essential—or like arranging layers of cotton padding to protect precious jewelry. Chang applied this principle not only to those closest to her, but also to herself. Chang was brilliant, talented, even worldly, and yet she fell in love with the first man who ever said anything nice about her. If that were the truth, how could someone so gifted bear the shame of revealing the sincere stupidity of it? Chang spent a lifetime writing around it, again and again, swaddling her own bare pain and putting as much space as she could between it and the image she presented to the world. She had been caught dishabille once in her life. It would never happen again. Click here to read Belinda Chang's essay on Eileen Chang, translated by Lee Yew Leong, from the Fall 2011 issue.